1 1/2-story, 3 x 1 bay, Carpenter Gothic house w/a steeply-pitched gable roof and exposed rafter ends. Sheathed in narrow clapboards w/cornerboards and an unusual frieze; a wide bead board w/sawtooth treatment at bottom. The central bay has a pavilion w/a first floor Gothic porch w/eaves balustrade. The gable has a gable screen w/ornate scrollwork repeated on a larger scale in the end gables. There is a second floor arched window w/two lancet sections. The front porch is supported by chamfered posts and pilasters on pedestals. Brackets have cut-out detailing. The entrance is tall w/a molded shallow pitched lintel board that also has cut-out detail. Windows are wide 2/2 w/small scrollcut hoods supported by brackets. Louvred shutters. 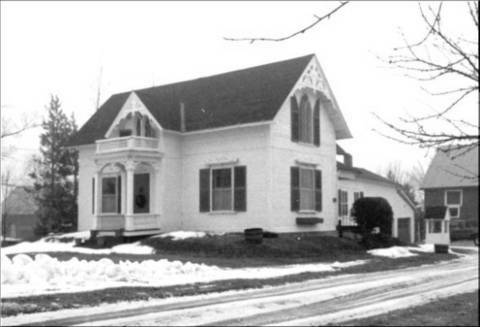 There is a 1 1/2-story, 28 x 12', clapboarded, gable-roofed horse barn southwest of main house of contemporaneous date. The main house is an exceptional example of Carpenter Gothic architecture in Vermont.